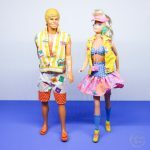 I’m often asked why I love Barbie, why I collect ‘dolls’, and how I can support her unrealistic body type, my answers to the first two are normally so simple, why the hell not, have you seen Barbie, she’s pretty cool, with regards to her ‘unrealistic’ body, come on people she’s a toy, a pretty fashionable toy, but a doll is still a toy. Whether you are a Barbie fan or not, I’m hoping that these pictures I took at the Barbie Exhibition at the Les Arts Décoratifs in Paris are going to show that Barbie is much more than her blonde locks and long legs, this exhibit show’s her roots, her fashion icon status, as well as the incredible careers she’s had over the years, there are more than 700 dolls, scale models, videos, art pieces and fashion items on display. I have to confess, I was a giddy little school girl going into this Barbie exhibition, as the pink archway kind of makes you think you are entering the Barbie dream house. The initial exhibits are geared more to the child within, showing where Barbie started and if like me you played with Barbie dolls you will probably see a few that you loved, styled and probably even cut the hair off, yep I did that I felt Barbie needed a bob like me. This section is fun and really shows you the scale of Barbie, there are so many different faces and hairstyles, and the 80s really did have the best dolls. 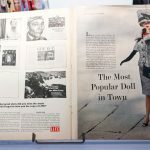 There’s even a section highlighting her 150 professions over the years, including US presidential candidate, cheerleader, computer engineer, nurse, doctor, and even a few fashion professions from photographer to designer and even editor. 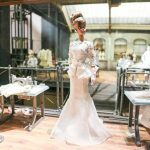 For me, the Barbie Exhibition really started to shine when you get upstairs and you see the impressive set-up that is kind of like a behind-the-scenes look at Barbie’s Parisian life in fashion. 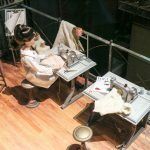 You see her in the atelier getting a fitting, as a bride, being a lingerie model on set, as an artisan sewing the fashion creations together, being street-style snapped, as well as attending a fashion show dressed in what could be Chanel. After these incredible set-ups comes the main fashion highlight, a moving fashion show, with dolls wearing designs by Oscar de la Renta, Dior, Diane von Furstenberg, Moschino, Paco Rabanne and Sophia Webster, as well as a whole section dedicated to the Christian Louboutin collaboration, it was so fun spotting all the incredible dolls that I have in my collection, as well as those ones I have added to my eBay search list. 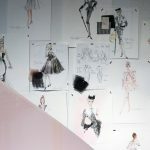 What was amazing was to see the reach of Barbie within the fashion community she really has worked with so many incredible designers, oh how I wish I could get lost in the Barbie archive. 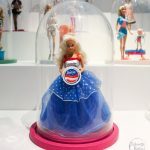 What I adored about this Barbie exhibition was that it wasn’t just geared to children, which could have been the easy move, especially with it being open throughout the summer, to be honest, I didn’t really see that many children. 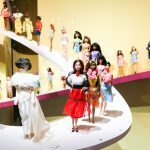 This was a stylish exhibition that highlighted Barbie’s fashion icon status, as well as the creativity behind her many faces, looks and careers. 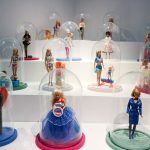 What I loved the most at about this exhibition was that it reignited my love affair with my favourite doll, now if we can have some more stylish collectable dolls I would like that a lot. 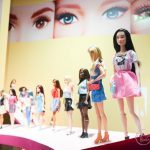 Have you been to the Barbie exhibition in Paris? 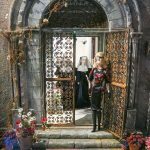 I would love to know your thoughts. 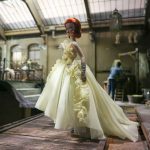 Barbie Exhibition, Les Arts Décoratifs in Paris runs until September 18, 2016.